Is this short film the acme of chutzpah? The American Petroleum Institute back in the 1950s produced a piece of propaganda not just about the importance and benefits of oil but about the importance of competition in the economy – ironic since only 43 years previously Standard Oil was one of the biggest and most ruthless near-monopolies until it was broken up by the US government. I must tune in to Obama’s speech so I’ll be able to tell my grandchildren about it. I’ll catch the stream on the BBC. 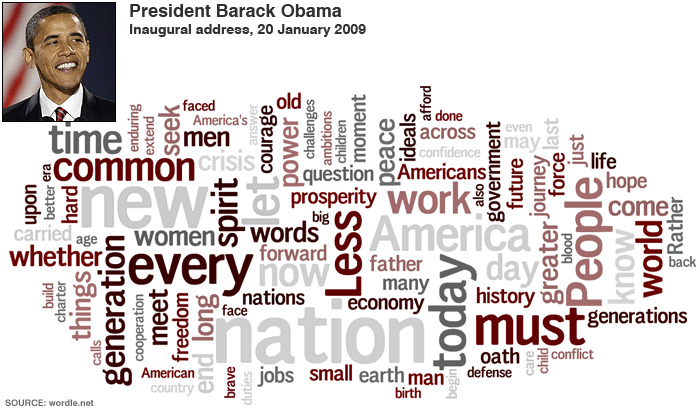 Hey the text of the speech isn’t being provided live as well – only highlights. But it must be around somewhere… google google… Nope. Hey I should microblog about that… tap tap tap… Hm. I don’t feel like the speech is really moving me as I’d hoped. I’ll blog about that too. Now the ever-expanding Google Transit project includes journey planning covering London and neighboring counties and if you go to London on Google Maps and switch on the transit “layer” your map will be overlaid with a display of all of the lines run by London Transport (ie not including most commuter trains). Thanks Richy C for the heads up! A book by an American who went to Cambridge in the 1840s (available free online). I was just arrested by the address from which the author said he was writing his preface – Horneshook, Hellgate. Turns out there’s a gate to hell in Oregon. Who knew? In 1979, Mario Capanna, leader of the Partito di Unità Proletaria, spoke in Latin as a protest, and was answered in Latin by a delighted Otto von Habsburg, son of the last Austro-Hungarian Emperor, and deputy for the Bavarian csu for twenty years.